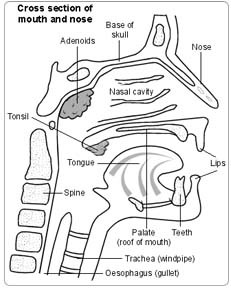 The nasal septum is the partition inside the nose made of cartilage (gristle) which separates the two nostrils. Usually the septum is straight and upright, and is in the middle of the nose. Inside your nose, the septum is bent over. You may feel that your nose is blocked or may have headaches and pain in the face. You may have sinus (the space inside any face bone) infections and even ear problems. Straightening out the septum will help you to breathe through your nose more easily, and lessen problems with your sinuses and ears. You will have a general anaesthetic and be completely asleep. A small cut will be made in the skin over the septum inside the nose. The surgeon will then straighten out the cartilage and move it back into the middle of the nose. Further back, the septum changes into bone, and this may be crooked. The surgeon will remove small pieces of bone to make it straight again. The cut inside the nose will be closed with stitches which will dissolve on their own and do not need to be removed. Plastic splints and gauze packing soaked in Vaseline will then put into the nose to keep everything straight and stop any bleeding. Because you will be asleep you will not feel any pain at all during the operation. The nasal packing and splints will be removed on the second morning after your operation by the nurses on the ward. You should be fit to go home later that day. Stop smoking and get your weight down if you are overweight. (See Healthy Living). If you know that you have problems with your blood pressure, your heart, or your lungs, ask your family doctor to check that these are under control. Check the hospital’s advice about taking the Pill or hormone replacement therapy (HRT). Check you have a relative or friend who can come with you to the hospital, take you home, and look after you for the first few days after the operation. Sort out any tablets, medicines, inhalers that you are using. Keep them in their original boxes and packets. Bring them to the hospital with you. On the ward, you may be checked for past illnesses and may have special tests to make sure that you are well prepared and that you can have the operation as safely as possible.. Please tell the doctors and nurses of any allergies to tablets, medicines or dressings. You will have the operation explained to you and will be asked to fill in an operation consent form. Many hospitals now run special preadmission clinics, where you visit for an hour or two, a few weeks or so before the operation for these checks. If you have a cold in the week before your admission to hospital, please telephone the ward and let the ward sister know. The operation will usually be put off, and you will be given time to get better before being sent for again. You need to get over your cold before you have your operation because by the general anaesthetic the cold could turn into a serious chest infection. You may be given oxygen from a face mask for a few hours if you have had any chest problems in the past. Usually the nose will be a little sore and uncomfortable after this operation. While the packing is in your nose you will have to breathe through your mouth, and this will make your mouth feel dry. Taking frequent drinks will help to keep it moist. You may find that the nasal packing makes your eyes water or gives you a headache. If you do get a headache or your nose feels sore, the nurses will give you an injection or tablets to help relieve this. Ask for more if the pain is not well controlled or if it gets worse.. A general anaesthetic may make you slow, clumsy and forgetful for about 24 hours. The nurses will help you with everything you need until you are able to do things for yourself. Do not make important decisions during this time. The next day there may be some swelling around the nose. This always improves quickly after the packs and splints have been removed. You may notice some numbness in the middle of your upper lip or the tip of your nose. This always gets better but may take several weeks. You will be able to get up and about and have a warm bath. On the second day after your operation, when the nurses remove the packing and splints from your nose there may be a little bleeding which usually stops very quickly. You will probably be able to go home later on in the day, usually in the early evening. Before your leave the ward you will be given an appointment to come back to the ENT (ear, nose and throat) outpatient clinic to see the surgeon again and have your nose checked. The nurses will advise about sick notes, certificates etc. At home, take two painkilling tablets every six hours to control any pain or discomfort. You may be advised to use an antiseptic cream, nose drops and steam inhalations. As the inside of the nose gradually opens up you will find that you can breathe more easily through the nose each day. If your nose runs you can wipe it, but do not blow your nose until two days after you get home, and then start off by blowing VERY GENTLY. To begin with you will see blood staining in your handkerchief, most of this will be old blood from your operation, but there may be a little fresh bleeding as well. This is expected and you should not worry about it.. Take it easy when you get home. Avoid hard physical exercise as this may make the nose bleed. Try and avoid smoky atmospheres such as pubs and clubs for the first couple of weeks. If possible try and avoid catching a cold within your first week at home. If you do get a cold you should see your GP for a course of antibiotics. It will be five or six weeks before the swelling inside the nose has completely gone and you get the full benefit of the operation. You should be fit to return to work about two weeks after your operation. You should be fit to drive one to days days after you leave the hospital. If there is a lot of bleeding during your operation, the surgeon may decide to leave the nasal packs and splints inside your nose for an extra day. If there is a lot of bleeding after the packs have been removed, then the surgeon will put them back in, either with a local or general anaesthetic. The chances of this happening are very slight. Provided the advice given above is followed you are unlikely to have any problems when you get home. There is a small risk that the nose may bleed when you get home. If this is just a spot or two, you should not worry. If the nose continues to bleed, come back to the ward.